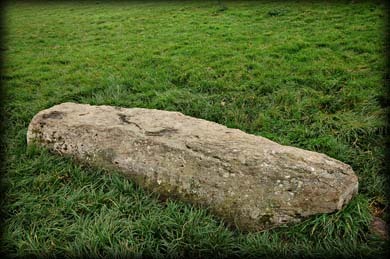 There are various theories about this stone. It is said to mark the burial place of Queen Maeve, although she is also thought to be buried in the cairn on Knocknarea in Sligo. Known locally as Medb's Butter, it is aligned to the north of Rath Cruachan with Mileen Meba, another prostate stone known as Medb's Cheese. 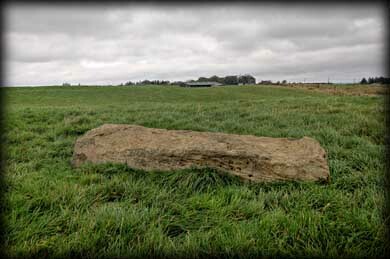 It is said that all future Kings of Connaught entering the Royal site must pass between these two stones. I was caught in a shower before I could photograph Mileen Meva, but wiil return soon to get images and visit other sites around Rathcroghan including Oweynagat (Cave of the Cats). Situated: Very easy, located in the same field as Rath Cruachan, about 70 metres NNE of the main mound. Discovery Map 33: M 7999 8382. Last visit Sept 2011.